Cetaceans include the whales, dolphins and porpoises. There are over 86 species of Cetaceans. 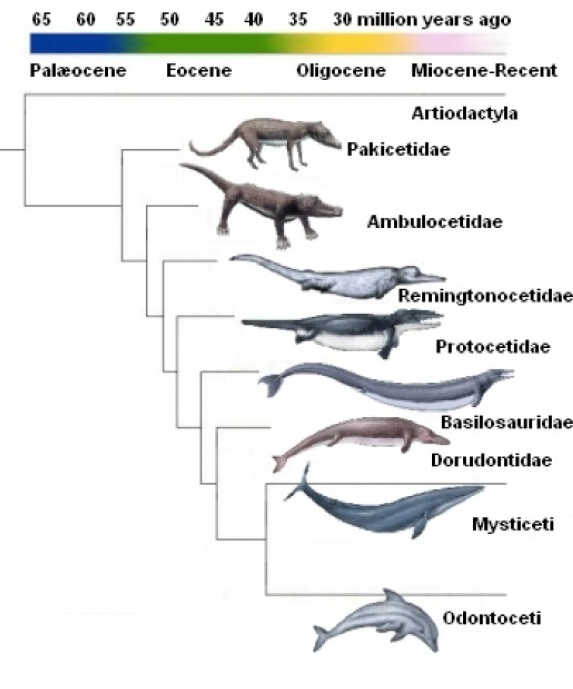 Whales belong to the order Cetacean (from the Greek word “ketos” which means whale), which is divided into the following groups: Toothed whales (Odontoceti) and Baleen whales (Mysticeti) -See images above. The biggest whale is the blue whale, which grows to be about 98 feet (29.9 m) long. The smallest whale is the dwarf sperm whale which as an adult is only 8.5 feet (2.6 m) long. Many whales are very acrobatic, even breaching (jumping) high out of the water and then slapping the water as they come back down. Sometimes they twirl around while breaching. Breaching may be purely for play or may be used to loosen skin parasites or might have some social meaning. This is another cetacean activity in which the whale pokes its head out of the water and turns around. Some whales stick their tail out of the water into the air, swing it around, and then slap it on the water’s surface; this is called lobtailing. It makes a very loud sound. The meaning or purpose of lobtailing is unknown, but could be done as a warning to the rest of the pod of danger. Logging is when a whale lies still at the surface of the water, resting, with its tail hanging down. While floating motionless, part of the head, the dorsal fin or parts of the back are exposed at the surface. Many cetaceans, especially baleen whales, migrate over very long distances each year. They travel, sometimes in groups (pods), from cold-water feeding grounds to warm-water breeding grounds. Gray whales make the longest seasonal migration of any of the whales. They travel about 12,500 miles (20,117 km) each year. Cetaceans have very strong social ties. The strongest social ties are between mother and calf. The toothed whales travel in large, sometimes stable pods. The toothed whales frequently hunt their prey in groups, migrate together, and share care of their young. Cetaceans give birth to live young who are nourished with milk from their mothers – they don’t lay eggs. 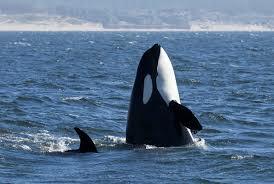 Cetaceans breed seasonally, usually in warm tropical waters, and females usually have one calf every 1-3 years. The gestation times range from 9-18 months. Whale calves can swim at or soon after birth. Mother whales care for their young for an extended period of time, usually at least a year, feeding them milk and protecting them. Young cetaceans are frequently mottled in color, camouflaging them from predators. Newborns have a sparse covering of hair which they lose as adults. Complex whale’s songs can be heard for miles under the water. The humpback’s song can last for 30 minutes. 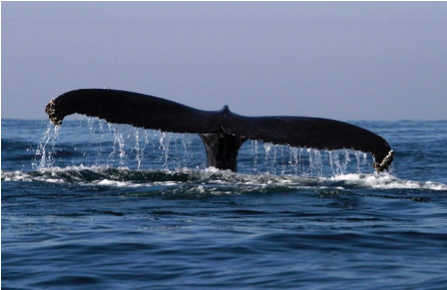 Baleen whales sing low-frequency songs; toothed whales emit whistles and clicks that they use for echolocation. The songs are thought to be used in attracting mates, to keep track of offspring, and for the toothed whales, to locate prey. is a skill that only toothed cetaceans, bats and a few birds have perfected. They send out rapid sound pulses and listen to their echo to find prey and determine their surroundings. It is thought that sperm whales also use echolocation to stun squid with loud clicks. Clicks can be repeated at different frequencies with low frequencies travelling long distances that are highly penetrating. Toothed whales have a structure called the melon on their forehead that focuses and directs the sound waves; incoming sounds are received primarily in the lower jaw, which is filled with fat or oil that transmits the sound to the inner ear. Marine mammals are capable of sophisticated communications because they live in a world dominated by sound, which travels much more efficiently through water than communicate with sound to coordinate hunts; Humpback whales sing to attract females. Female pinnipeds and their pups recognize each other by their “voices.” Slapping the surface during breaching can be heard for miles. 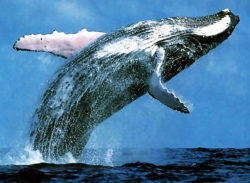 Whales have no vocal cords; they warble for up to 30 minutes between breaths just by recycling air.